Facebook on Monday began rolling out a new feature in its iOS and Android apps called the Marketplace, where users can buy and sell items locally in a manner similar to Craigslist. The Marketplace is more inherently visual, for instance defaulting to a gallery of items being sold in their area. Users can search with filters for price, category, and location, or simply browse categories to see what's available. Tapping on an item will reveal photos of both the product and the seller, along with a price and general description. From there shoppers can save an item, make an offer, or message a seller for more details. 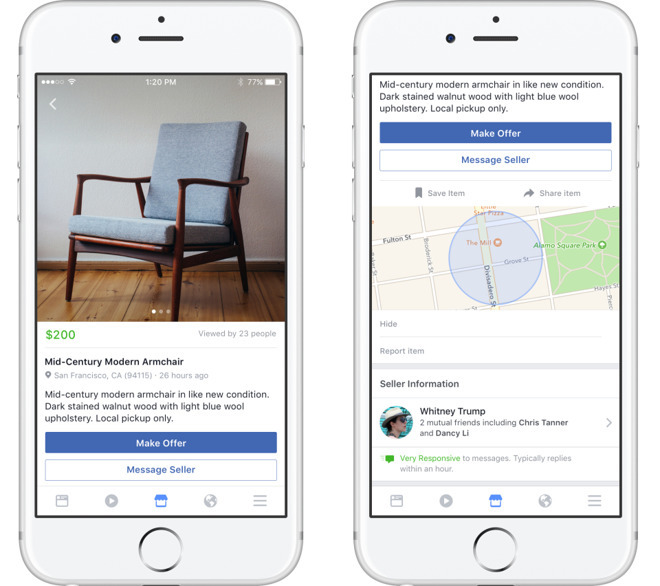 Sellers are identified not just by their usual Facebook details, such as friend connections, but also by how quick they are to respond to messages. Location is kept ambiguous. Users can create their own listings entirely within the app, subject to restrictions. Sellers must be over 18, and can't for instance offer alcohol, pets, guns, or drugs, or "adult" goods and services. In fact any kind of service is off-limits, along with other non-tangibles, such as downloads. The Marketplace will rolling out to app users the U.S., U.K., Australia, and New Zealand over the next several days. Expansion to the Web and more countries is due "in the coming months," Facebook said.